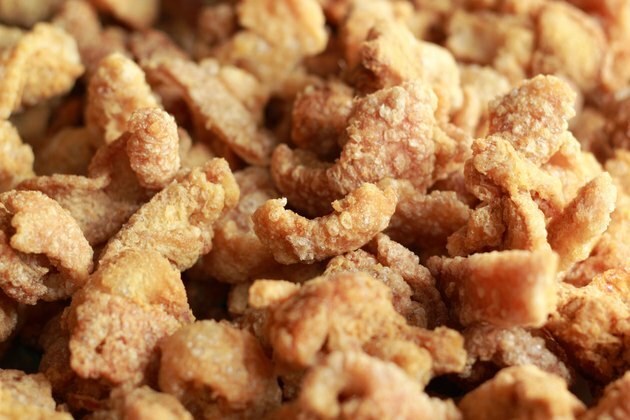 You find pork rinds in many national cuisines -- in Canada, they're called "scrunchions," in the Southern U.S. they're "cracklings" and to the Brits they're known as "scratchings." Whatever you call them, they're pork fat, fried and salted, to make a crispy, addicting snack. They have no carbohydrates, making them a safe indulgence on a low-carb plan. Just be sure to eat them in moderation; their sodium and fat content are high. To punch up the flavor, serve the rinds with a creamy dip. The catch is, your dip needs to be low-carb, too, so the snack fits your low-carb diet. Pork rinds may taste a little bland on their own, making them the perfect vehicle for bold, spicy flavors. Make an easy dip by mashing avocado -- with just 1 gram of net carbohydrate per half of a Hass variety -- with lime juice, minced garlic and chopped jalapenos. Net carbs are those that affect your blood sugar. Figure them by subtracting a food's fiber grams from its carbohydrate grams. Melt cream cheese together with salsa for another dip that contains minimal carbs. Salsa has 1 to 2 grams of net carbs per tablespoon; cream cheese has 1 gram of net carbohydrate per tablespoon. Buffalo chicken wing sauce has just 1 gram of net carb per tablespoon and adds tang to the crunchy rinds. Tangy pimento cheese marries well with the salty crunch of pork rinds. Stir a pinch of garlic powder and a couple of tablespoons of pimentos, which have less than 1 gram of net carb per ounce, into a mixture of mayonnaise, shredded cheddar cheese, shredded Monterey Jack cheese and cream cheese. Season to taste and refrigerate for an hour to allow the flavors to marry. The cheddar and jack cheeses have just trace carbs per ounce and the mayonnaise offers less than 1 gram of net carbohydrate per tablespoon. Avoid light mayo as the flavor is sometimes boosted with added sugar, which raises the carb count. Use pork rinds to scoop up a flavorful, creamy spinach and bacon dip. Cook a few slices of bacon until crisp and drain on a paper towel. In a separate bowl, steam fresh spinach in the microwave with a little water. Wrap the cooked spinach in a paper towel and squeeze out any excess water. Mix the spinach with minced garlic, a squirt of lemon juice, salt, pepper, cream cheese, grated Parmesan cheese and sour cream. Put the dip into a small casserole dish and bake for 10 to 15 minutes in a 350-degree oven until bubbly. Break the cooked bacon into bits and sprinkle over the top before serving. The cooked spinach has about 1 gram of net carb per 1/2 cup. The cheese, lemon juice and garlic add 1 to 2 carbs total to the entire dish, and the bacon has a trace of carbs. Whip up a tasty dip for pork rinds using sour cream as the base. Two tablespoons of the regular, full-fat variety contain less than 1 gram of carbohydrate. Light sour cream is whipped together with fillers and sweeteners to resemble the full-fat variety. It should be off your low-carb menu as it contains considerable carbs. Dip pork rinds into plain sour cream, or into sour cream mixed with chopped, fresh herbs, such as tarragon or dill. Add chopped black olives and onion powder to the sour cream or mix the sour cream with chives and paprika.